Medium and large-sized regularly-shaped fields occupying the floor and lower slopes of the Usk, lower Ysgir and Aberbrân valleys west of Brecon, with small medieval church settlements at Llanspyddid and Aberysgir and elements of transport history associated with Roman roads, post-medieval roads, and the railway. Early prehistoric settlement and land use is suggested by the find of a Neolithic stone axe near Pennant farm. Strategic military Roman roads running southwards in the direction of Ystradgynlais (Powys) and south-westwards to Llandovery (Carmarthenshire) from the Roman fort at Brecon Gaer are thought to run through the character area although their courses are speculative since no certain surviving structural evidence has yet been found. Inscribed Roman milestones indicate that the road between Brecon Gaer and Llandovery was maintained into at least the later 3rd century. Roman finds are known from the village of Llanspyddid which may also indicate an early settlement focus. In the early medieval period the area formed part of Cantref Selyf within the kingdom of Brycheiniog, which following the Norman conquest under Bernard de Neufmarché formed part of the marcher lordship of Brecon. The small parochial church settlement at Llanspyddid originated in the pre-Conquest period and formed part of the manor of Brecon following the conquest. Little early recorded history is attached to the earth and stone castle and church at Aberyscir though these probably date to the post-Conquest period, in the late 11th and 12th centuries, land here forming a manor granted by Bernard de Neufmarché to Sir Hugh Surdwal in the late 11th century. The medieval bishop of St David’s held ploughlands at Aberbrân, listed in the Black Book of St David’s, which may be represented by the strip-field pattern in part of this area. At the Act of Union in 1536 the area later formed part of Merthyr Hundred within the county of Brecknock. It subsequently formed parts of the 19th-century tithe parishes of Llanspyddid, Llanspyddid Penbont and Aberysgir. Medium and large-sized regular fields occupying the floor and lower slopes of the Usk and lower Ysgir valleys west of Brecon, mostly between a height of about 140-160 metres above sea level with predominantly hedged boundaries. 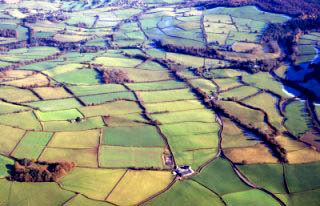 Field patterns in the eastern part of the area, near Aberbrân and between Llanspyddid and Brecon, appear to be derived from the enclosure of medieval open-field furlongs. These include some areas of relict ridge and furrow cultivation possibly of medieval date associated with these settlements. Settlement is characterized by the two small parish church settlements at Llanspyddid and Aberyscir and dispersed farms of medieval and post-medieval origin. Llanspyddid church, dedicated to St Cattwg, dates from the pre-Conquest period, the churchyard housing a pillar stone of 9-10th century date, which is thought to mark the grave of Aulach, father of Brychan. The churchyard was probably once considerably larger. The small nucleation at Aberysgir appears to have originated as a small manorial centre with earthen castle and probably a proprietorial church foundation assocated with the manor granted to Sir Hugh Sudwal. Aberyscir Court is a gentry farmhouse of the 1830s, probably built in succession to an medieval manor house. The character area includes a number of other widely dispersed characteristic stone farm complexes of 16th-, 17th and early 18th-century date which are likely to be of medieval or early post medieval origin. These include Pen-y-wern, Penishapentre, Fenni-fach and Pennant, comprising farmhouses associated with a variety of outbuildings including barns, stables cowhouses, cart sheds and granaries, sometimes set around a partly enclosed yard. Three 18th to early 19th-century stone road bridges crossing the Afon Brân and its tributaries, Pont-yr-Fran, and Aberbrân-fach Bridge and Aber-brân Bridge, fall along the western margins of the area. The dismantled course of the Neath and Brecon Railway railway line, completed by 1872 and closed in 1963, crosses the northern side of the area.